Boston, Mass. 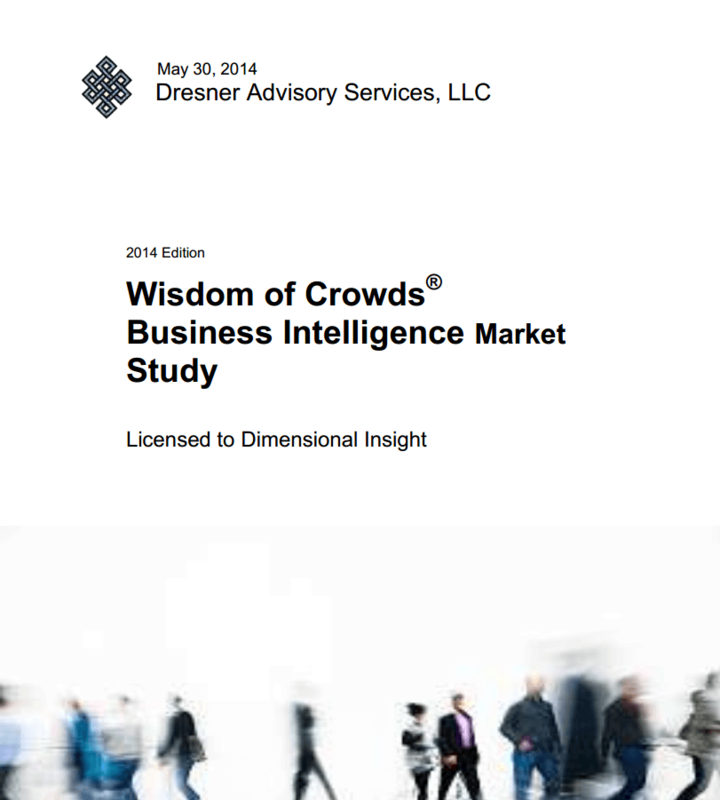 – June 3, 2014 – Dimensional Insight, a developer of business intelligence (BI) solutions, is pleased to announce that it received the highest aggregate score amongst BI vendors in the annual Wisdom of Crowds® Business Intelligence Market Study and customer survey conducted by Dresner Advisory Services, LLC. Dimensional Insight outscored all other vendors in the study. Dimensional Insight announced the results of the Market Study to its customers today at its annual users conference in Boston. More than 1,200 BI users across the globe responded to an online survey, and the study was open for input to any valid and qualified user with first-hand BI vendor and product experience. A total of 24 vendors were ranked across five segments. Vendors received scores of 1 to 5 for 33 different criteria. These dimensions were then grouped into seven aggregate categories. Dimensional Insight received the top scores of all vendors in five of these categories (value for price paid, quality of technical support, quality and value of consulting services, integrity and whether the vendor is recommended), with a perfect 5.0 score for “recommended.” Dimensional Insight scored among the top 3 for the remaining two aggregate categories. 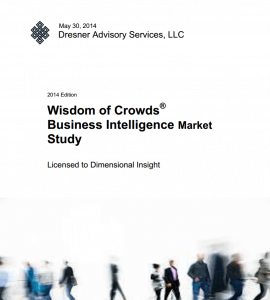 The Wisdom of Crowds Business Intelligence Market Study is published every year by Dresner Advisory Services, an independent analyst and advisory firm specializing in business intelligence and related areas. This is the fifth consecutive year that Dimensional Insight has posted strong scores in the survey. To see the detailed vendor rankings, as well as BI deployment insights and best practices from real BI practitioners, you can download a full copy of the report from http://info.dimins.com/Dresner-Wisdom-Of-Crowds-BI-Report.html. You may also like to read DI’s VP of Marketing explaining her view of the best way to use this independent analyst report to support your information gathering, evaluation and BI solution selection needs. DI’s Lauren McCollem examines the latest Wisdom of Crowds report and recommends 3 ways to use it when making your BI selection. Read her blog here. Our own Debbie Lonsdale has also published a blog which examines why the number one business objective has such varying levels of success in BI implementations according to the Dresner results. Read her post here. For a brief video in which 5 surprising revelations from the report are revealed – go to Youtube. Dimensional Insight is a leading provider of business intelligence (BI) solutions. The company offers a comprehensive set of BI capabilities ranging from data integration and modeling to sophisticated reporting, analytics, information portals and dashboards. Founded in 1989, Dimensional Insight has thousands of customer organizations worldwide. Dimensional Insight’s Diver Solution consistently ranks as a top performing business intelligence platform by customers and industry analysts in its core market segments including healthcare, manufacturing and distribution industries. For more information, please visit www.dimins.com. Dimensional Insight and The Diver Solution are trademarks or registered trademarks of Dimensional Insight or its subsidiaries in the U.S. and other countries. Other company names, product names and company logos mentioned herein are the trademarks, or registered trademarks of their respective owners.